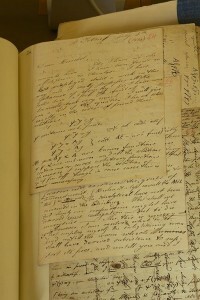 Letter from Charles Babbage to J F W Herschel on 4 July 1814. (June 2014) As part of Wikipedia:WikiProject Royal Society a special photo session in the Royal Society Library in London has resulted in Commons:Category:Royal Society Library, with over 50 photos of their treasures, mostly 17th century manuscripts, including several of Herschel’s correspondence with Charles Babbage, Charles Blagden‘s diaries, the 1st edn of Sylva, by John Evelyn, one of the early minute books, Robert Boyle‘s notebooks etc, the manuscript fair copy of Newton’s Principia etc. Please add these to articles as appropriate. Many thanks to User:Mike Peel for coming from Manchester to take the photos! What happens when you release photos on Wikimedia Commons? I started making my photographs available on Wikimedia Commons under a Creative Commons licence in 2006. Since then, I have uploaded over 3,500 photos to Commons, and I plan to upload many thousands more in the future. The main reason I started to upload my photos was to illustrate Wikipedia articles, and that’s still a big reason why I have continued doing so. However, only 16% of the images I’ve uploaded are currently used on the Wikimedia projects. So, why am I continuing to upload so many images? My hope is that, in the long run, my photos will help preserve history. I hope that they will provide a record of the state of things today to others looking back at this time in the future, in a similar way to how we look at 50-year-old photos today. I want to make sure that those looking back on our history don’t have to worry about the copyright of those images, but can freely use them in their own projects. In December 2007 I took a photo of the London Eye; I uploaded it to Commons a month later. I was taken aback in August 2008 when I got an email out of the blue from a couple who had recently gotten engaged on the London Eye – they’d found my photo and loved it so much that they had it printed on canvas. Due to a mistake by the delivery company, they accidentally received two copies of it – so they got in touch with me and sent me the extra copy! To this day this print acts as a focal point for my flat. At Science Online London 2011, which took place at the British Library, I took a photo of Michael Nielsen. The photo was subsequently published by the New York Times, with Michael Nielsen letting me know that this had happened. More recently, I was contacted by Nature Cymru who wanted to let me know that they had used one of my photos in their latest edition – a picture of seagulls nesting in Conwy Castle. I uploaded this photo as part of a series of photos I took of Conwy Castle, and this was the photo I expected to be of least use – but it turned out to be the first of this set of photos to be reused. One of the lessons I’ve learnt throughout this is that, realistically, no-one respects the licence that your photo is licensed under – they’ll simply use it for their purposes. If you try to keep full copyright of your photo and deny people the use of the image, then you’ll be ignored – but if you release it under a free license then you’ll be able to reasonably ask for proper attribution. Also, people will generally go out of their way to let you know that they are using your image under a free license, if you ask them to, but if you restrict the use of the image then they’ll simply use it without letting you know. Posted on 20 June 2014 Categories photography, Wikimedia2 Comments on What happens when you release photos on Wikimedia Commons? Posted on 18 March 2014 Categories PersonalTags websiteLeave a comment on Time for a new website! Intelligent life: does it exist? The Independent published an article yesterday about “Seti: The hunt for ET”, in the form of a bullet point list of 50 items. There are a lot of gems this article – it’s well worth reading (and then checking Wikipedia for the complete story in each case). I couldn’t resist drawing attention to, and commenting on, some of them though – hence this blog post in addition to my twitter. Posted on 28 September 2009 25 October 2013 Categories AstronomyTags seti1 Comment on Intelligent life: does it exist? I have to confess, it’s been a while since I’ve actually sat down with a pen and paper during a lecture and taken down notes. I don’t normally need to – I hopefully absorb the important things, and the details aren’t quite as important to remember as they can normally be found in papers. This time, however, I wanted to put summaries on here, so thus far I’ve taken around 8 pages worth… Now I just have to work out what to say here. The most interesting talk I’ve been to so far from the point of view of learning the most was the plenary talk on STEREO yesterday morning. The sun is definitely not my field (way too local), although I’ve looked at it a few times through a solar telescope, so I was mostly relying on my knowledge from undergraduate and a few extra talks. STEREO, as the name might suggest, is actually two satellites, both going away from the earth but in opposite directions, giving us a 3D view of the sun. It also gives us a view of the Earth-Sun line – which you normally look down, rather than across. That means that we can see coronal mass ejections coming towards us, and gain up to 2 days of advanced notice – very important, considering the impact that these have on satellites and the Earth in general. The first Earth-impacting one of these was actually seen – from both sides – in the middle of December 2008! This wasn’t seen at all by Earth-based instruments. STEREO has also seen other cool things, including the stripping of a comet’s tail by a coronal mass ejection. More info on STEREO is on Wikipedia. I’m currently at JENAM, which is a combination of the Royal Astronomical Society’s Annual General Meeting and the Joint European and National Astronomy Meeting. It’s based at The University of Hertfordshire in Hatfield. Its starting event was a buffet (free food and drinks; always good), followed by a Music and Astronomy event. Although I was a bit dubious going in, this turned out to be quite a good event – classical music combined with an overview of the history of the relationship between music and astronomy (the two are linked by a surprising number of things). Hopefully the image on the right gives a flavour of the event: strings on the left (with a piano on the far left; sadly I couldn’t get this in as well), with two speakers on the right and Jon Culshaw in the middle interjecting quotes in the style of various famous people (Sir Patrick Moore, George Brown, George Bush, …). On the left are the people leading the evening: the right-most two are Alice Williamson and Dr. Robert Priddey, who were narrating the event, and that’s Jon again second from the left. I think the telescope is a likeness of the one Gallileo used (not the real one; that’s apparently in philladelphia). BTW, Dr. Mario M. Bisi has also covered this event, and will presumably be blogging about the rest of the conference too from a solar physics perspective. Is there anyone else blogging this too? This was the first thing that sprang to mind* after reading the excellently named Cosmic Variance’s recent post “Blogs That Should Exist“. “Spherical Cow” could have been an excellent name for a blog, and I was very tempted to rename this fledging blog as such. Tragically, the .com address is already registered, but is completely unused! The .net domain – the second choice for a top-level domain on the internet – is also registered, but at least that’s used for physics education (albeit underused). So, at least for now I’ll stick with using my real name as the name of the blog (assuming I end up writing enough for this to count as a proper blog). For those of you that want a physics or astronomy blog but don’t want to use your real name, here’s a few suggestions**. Note that I haven’t googled them, so some (or even all) may already exist. Or, if nothing appeals, make up something with an “X” in the name. That always seems to go down well. ** No guarantees as to their originality or humour are made. They might not even make sense.